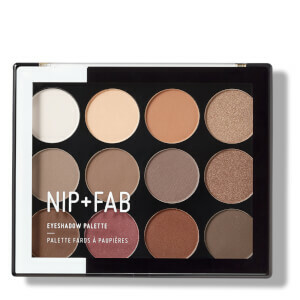 Create subtly striking makeup looks with the NIP+FAB Make Up Eyeshadow Palette in Cool Neutrals, a collection of 12 matte and shimmer shades to add depth and definition to eyes. From sparkling gold to palest pink, the richly pigmented powders smooth onto skin easily and blend effortlessly for buildable, customisable colour. 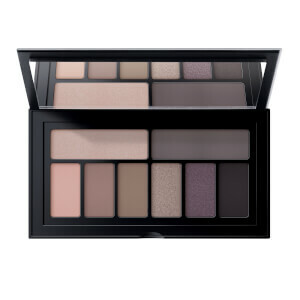 Bringing together a range of light and dark shades, the palette helps you to create a sculpting effect on eyes, contouring from the lash line to the brow bone for a sophisticated and salon-worthy finish. Com um pincel de sombra de olhos, aplique uma sombra mais clara por toda a pálpebra e para cima, em direção ao osso das sobrancelhas. 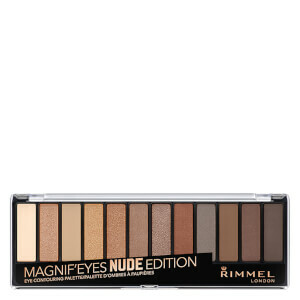 Acrescente uma sombra média nos cantos externos dos olhos e esbata para dar uma definição suave. Acrescente uma sombra de brilho aos cantos internos dos olhos para os destacar! Golden Dream: Talc, Mica, Magnesium Stearate, Synthetic Fluorphlogopite, Dimethicone, Ethylhexyl Palmitate, Polyisobutene, Synthetic Wax, Phenoxyethanol, Ethylhexylglycerin, Paraffinum Liquidum (Mineral Oil), Tin Oxide, +/- May Contain: CI 77891 (Titanium Dioxide), CI 77491 (Iron Oxides), CI 77499 (Iron Oxides), CI 77492 (Iron Oxides). Moon Shimmer: Talc, Mica, Magnesium Stearate, Dimethicone, Synthetic Fluorphlogopite, Ethylhexyl Palmitate, Polyisobutene, Synthetic Wax, Phenoxyethanol, Ethylhexylglycerin, Paraffinum Liquidum (Mineral Oil), Tin Oxide, +/- May Contain: CI 77891 (Titanium Dioxide), CI 77491 (Iron Oxides), CI 77499 (Iron Oxides), CI 77492 (Iron Oxides). Bronze Petal, Muse, Lustre: Talc, Mica, Magnesium Stearate, Dimethicone, Ethylhexyl Palmitate, Polyisobutene, Synthetic Wax, Phenoxyethanol, Ethylhexylglycerin, Paraffinum Liquidum (Mineral Oil), Tin Oxide, +/- May Contain: CI 77891 (Titanium Dioxide), CI 16035 (FD&C Red 40 Lake), CI 77491 (Iron Oxides), CI 77499 (Iron Oxides), CI 77492 (Iron Oxides), CI 77007 (Ultramarine Blue). Copper Pink, Soft Amber: Mica, Talc, Magnesium Stearate, Dimethicone, Ethylhexyl Palmitate, Polyisobutene, Synthetic Wax, Phenoxyethanol, Ethylhexylglycerin, Paraffinum Liquidum (Mineral Oil), Tin Oxide, +/- May Contain: CI 77891 (Titanium Dioxide), CI 16035 (FD&C Red 40 Lake), CI 77491 (Iron Oxides), CI 77499 (Iron Oxides), CI 77492 (Iron Oxides), CI 77007 (Ultramarine Blue). Dusty Rose, Elegance, Charcoal, Harmony, Soulmate: Talc, Mica, Magnesium Stearate, Dimethicone, Ethylhexyl Palmitate, Polyisobutene, Synthetic Wax, Phenoxyethanol, Ethylhexylglycerin, Paraffinum Liquidum (Mineral Oil), +/- May Contain: CI 77891 (Titanium Dioxide), CI 16035 (FD&C Red 40 Lake), CI 77491 (Iron Oxides), CI 77499 (Iron Oxides), CI 77492 (Iron Oxides), CI 77007 (Ultramarine Blue).